When a link is posted within a block of text that link is only distinguishable through colour. The colour contrast between the link text and paragraph text is quite subtle and so links can be difficult to spot. It may also be tricky for people with colour blindness. Can we add a visual cue as addition to the colour to distinguish the links? Underline works, or bold text for example. meta-2542.underline.patch​ (2.0 KB) - added by SergeyBiryukov 2 years ago. meta-2542.underline.PNG​ (34.9 KB) - added by SergeyBiryukov 2 years ago. meta-2542.bold.patch​ (2.0 KB) - added by SergeyBiryukov 2 years ago. meta-2542.bold.PNG​ (35.1 KB) - added by SergeyBiryukov 2 years ago. meta-2542.patch​ (5.8 KB) - added by SergeyBiryukov 2 years ago. meta-2542.underline.patch​ adds an underline for links in post content: meta-2542.underline.PNG​. meta-2542.bold.patch​ makes them bold: meta-2542.bold.PNG​. @mapk: What would you prefer here? This is difficult. We don't really do this elsewhere in the Support forums do we? So do we make a new style that just affects links within comments within forum posts? I totally agree that links aren't viewed easily in the comments. So after looking around, I found this. Link styles are underlined, and @ mentions are in bold... within posts. Let's go with this. Fwiw, the other link in that screenshot – the tag – should probably also be bold. Worth fixing wherever that code is and standardizing everywhere. Thanks! Mentions on the forums don't have a specific class though (unlike P2 mentions with class="mention"), so we'd need to find and adjust the code that converts them to a link to also add a class. @samuelsidler On my local bbPress install, mentions are not linked. Could it be a dotorg-specific plugin that converts them to a link on the forums? Maybe. But we also have a custom plugin that could be interfering here. @coffee2code: Can you take a look at wporg-notifications.php and see if that's related? 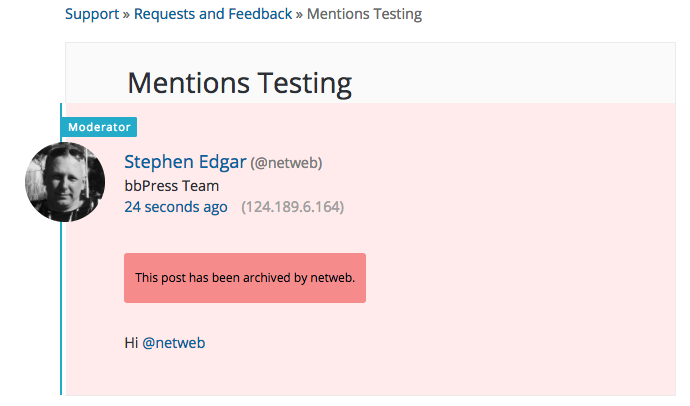 Ah, bbp_make_mentions_clickable_callback() only works for existing users of the site, that would explain it. Going with meta-2542.patch​ for now, until bbPress is updated to 2.6 on the forums. Support Forums: Add mention class to bbPress' built-in clickable user mentions for styling purposes. Support Theme: Add a visual cue to links in post content to improve accessibility. Regular links should be underlined. User mentions should be in bold. Support Theme: After , don't underline links in revision logs, only in actual post content. Support Theme: After , add underline to links in regular pages' content as well for better accessibility.